▪ More daily objectives and achievements. ▪ New Halloween Avatar - Unlock it now! ▪ 3 exciting new levels to be explore and master. We made things better! You ask, we listened. Let us know how your play experience has improved or if we missed something you want. 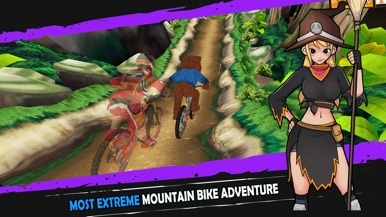 The best mobile bike game,XCITE MOUNTAIN BIKE EXTREME COURSES – the craziest 3D graphics you've ever seen come together with perfectly designed levels to form an insane riding experience. Explore a vast world on your mountain bike. Compete against your friends on Global Leaderboards. Master endless-based tracks to challenge the world's top riders for the best times. 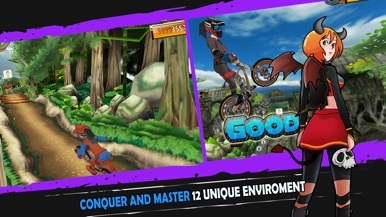 Race your mountain bike through a world of adventure, crazy characters, and unfairly addictive tracks! Experience the ULTIMATE skill-based RACING game on your iPhone! 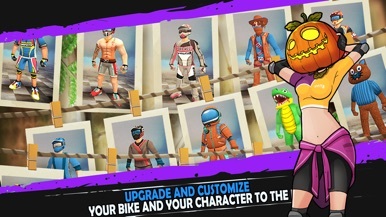 ▪ COLLECT COINS and UPGRADE your bike! ▪ IMPROVE your score by UNLOCKING NEW ABILITIES! ▪ LEVEL UP your rider and REAP THE REWARDS! ▪ UNLOCK CUSTOM SKIN such as Crocodile Suit, Astronaut Suit and more! ▪ PERFECTED GHOST RACING. 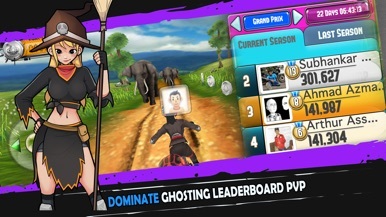 Race any ghost on the leaderboards of any track! ▪ Are you a competitive person? Then don’t download this game! ▪ Invite and challenge your Facebook friends and make the competition personal! Embark on a light-hearted adventure to various interesting tracks, cities and mountain - with the craziest 3D graphics you've ever seen come together with perfectly designed levels to form an insane riding experience. Over 18 different Real World tricks Plus Fakies to learn and combine these tricks to create an endless amount of different combos. Post your Replay to Youtube, Facebook, Twitter and more! (Only on iPhone 4+, iPod Touch 5, iPad 2+, iPhone 6, iPhone 6+). Bike your way across stunning 3D uphill and downhill environments. 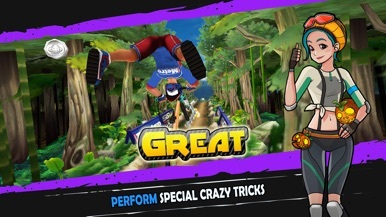 Perform tricks, upgrade skills and use powerful items to help you bike as far as you can. Become a downhill mountain biking champion and ride the 7 locations with 20+ different obstacles and environment, learning over 18 real world tricks like the “tail-whip”, “back-flip”, “bar-spin”, “decade” and many more. You also have the ability to combine these tricks to create an endless amount of different combos. Beautiful graphics, challenging game play and heart stopping jumps ensure you'll love this mountain bike game and never find another like it. Supports: English, Simplified Chinese (简体中国), Bahasa Malaysia, Thai(ไทย) and Bahasa Indonesia(Coming Soon). Hey guys! We are small games developer based in Malaysia and Thailand that live with dream and passion. We've been doing this lovely thing for about 5 years now and we just created this werakugames channel. To keep our dream and passion in game development, we will be sharing frequently on several games that we work on right now. So what can you expect? Several of highlights and gameplay from various games that develop in house such as CaveGuys, Super Stick Badminton, Tim the Explorer and more. Hope you'll enjoy our channel! With over 2 millions downloads and growing, WerakuGames strive to create a great free-to-play game. We are inspired to create beautiful games with an awesome experience, and will not settle for less. Cric Live Line gives you ball by ball fastest live updates of cricket matches which are faster than any other media. - Fast and accurate. - Market and Session. - Upcoming Schedules. - Recent Results. - Live Scorecards. - Up Coming Matches Polls. - Season Explorer. - Player Stats.